Introducing another partner for this year’s Trash Tribe expedition to Chilli Beach – the wonderful folk over at Organic Crew. You may have noticed our tribe rocking the beautiful organic cotton tees that Organic Crew created for the expedition. Read more about the brand below. We love the story behind Organic Crew – can you tell us how you went from working in the corporate world to starting a sustainable, ethical and organic clothing brand? The seed was planted when I was quite young and working at Esprit with a visionary leader who cared. His name was John Bell and he taught me that you had to be mindful of every part of the process and do as little harm as possible (to the environment, animals and people) whilst creating beautiful product. More recently, I have worked for some larger corporates and seen firsthand the effects of fast fashion – I wanted to create a brand that manufactured the right way, stood for something, and inspired and educated. Tell us why organic cotton is so important for the health of our planet and our bodies? The way organic cotton is grown is better for the planet, the animals and the people who tend to the crops. The process uses way less water and the waste is clean. The effect of organic cotton on our bodies is non-toxic, which is so important as reducing the volume of toxins we are exposed to on a daily basis is important. You need to do what you can. Do you think there is a trend towards more companies using organic textiles, or is there still a long way to go? Prior to starting Organic Crew, I ran a cold pressed juice company and could see the growth of organic in the food industry. I think there is a movement happening where people now care about what goes into their food and onto their skin. So the movement has started with food, then moved to skincare and now clothing. The skin is the largest organ in the body and therefore can absorb the most chemicals. People are beginning to understand the differences and effects. Melbourne was the original hub of Australian fashion, why was it so important for you to produce your garments in Melbourne rather than offshore? It was very important as I needed to be able visit the factory and oversee what was happening at every point. We have just been accredited by Ethical Clothing Australia who have very strict guidelines on the use of labour and conditions. I wanted complete transparency and having a factory located in Melbourne made this possible. It was also so nice to go “old school” in our approach. I grew up working in fashion and to be able to give these local factories the work when so many go offshore felt so good. One of our garment workers has been sewing in our factory for 38 years! Plus the quality is amazing, you will see this in our garments, they are made with love! What advice would you give to other brands wanting to start using more sustainable textiles or produce in Australia? It is possible and there are so many options in terms of materials. The margins are obviously lower given the local production but the quality is amazing and the people are so great to work with. It is definitely a growth category and demand is rising. I know our factory makes many well known Australian brands with more coming on board every day. Lastly, why did you want to support the Trash Tribe expedition as a brand partner? We are passionate about the environment and making a small difference where we can. 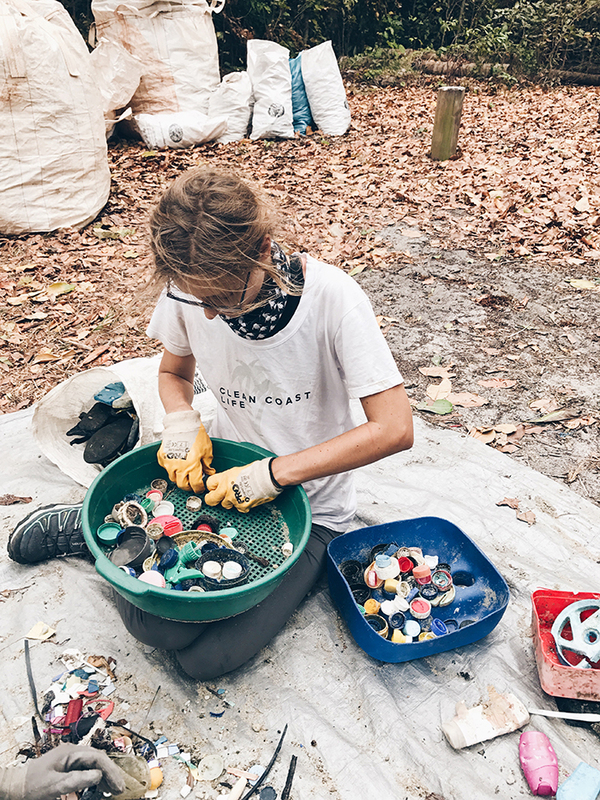 We heard about the Trash Tribe whilst on holiday in Byron Bay and wanted to help in any way we could. Our beaches are the best in the world and we all need to look after the country we are so blessed to live in. We are so grateful that we could contribute to this initiative and hope that education and awareness will lead to cleaner beaches in the future.